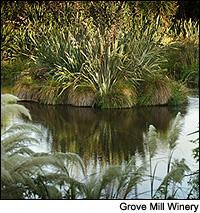 New Zealand producer Grove Mill helps protect these wetlands near the winery, in Marlborough. Wineries are trying to offset greenhouse gas emissions … but is it feasible? Many scientists believe that carbon dioxide emissions play a significant role in global warning. Environmental groups are urging industries and individuals to go "carbon neutral" by reducing the amount of carbon emissions, or finding ways to neutralize carbon through natural means. Now wineries are embracing this earth-friendly agenda. "Global warming is the most serious issue on the planet," said Paul Dolan, co-owner of the Parducci Family Farmed winery in Mendocino County, the first American winery to go carbon neutral. "I don't want to see every winery in the United States go carbon neutral, I want every single person in the world going carbon neutral," he said. No winery can reduce its carbon emissions to zero, since releasing carbon dioxide is part of the fermentation process: Yeast converts the sugar in the grape juice into alcohol, and releases carbon dioxide as a byproduct. But wineries can limit their other carbon-producing activities, by saving energy or switching to non-carbon-based fuels. And now there are ways to compensate for their remaining emissions. Parducci, for example, has turned to solar and wind power, and installed an "anaerobic digestor" to get rid of the methane released from livestock manure on the family farm. To offset its remaining, uncontrollable carbon emissions, such as those from fermenting wine, Parducci called in several different "carbon merchants." Carbon merchants such as Maryland-based Carbonfund.org or 3 Phases Energy Services in California essentially charge a fee to the winery based on how much carbon it produces. That money then goes to planting enough trees to pull the same amount of carbon from the air, since trees absorb carbon dioxide as part of the process of photosynthesis. According to Michael Stewart, partnerships manager for Carbonfund.org, a single, large sugar maple tree can remove up to 450 pounds of carbon dioxide from the atmosphere each year. Becoming carbon neutral seems easy enough, but for the first carbon-neutral winery, Grove Mill in Marlborough, New Zealand, offsetting its emissions came only after years of hard work, according to winemaker Dave Pearce. Along with using lighter-weight bottles to reduce fuel costs during transportation, in addition, "we sponsor forest regeneration in the Marlborough Sounds, not far from our winery," Pearce said. "At present we contribute to about 100 hectares (247 acres) of forest regeneration." This fits with the winery's other local green efforts, which include the protection of nearby wetlands and a rare species of frog, called the Southern Bell. Paul Dolan of California's Parducci winery wants everyone to be carbon-neutral--not just wineries. Australia-based Trees for Life, a nonprofit carbon merchant, planted 2,031 trees in South Australia last year to offset carbon produced at Elderton Wines, located in the Barossa Valley. And Backsberg Estate in South Africa became the third winery to go carbon neutral, working with a group that planted trees around and in the nearby village of Klapmuts. Like many other carbon-neutral wineries, Backsberg has also switched to biofuels for its farm equipment and set aside part of its land as a nature preserve. Even some wine retailers have gone carbon-neutral. JJ Buckley Fine Wines, a wine shop in Oakland, Calif., works with Carbonfund.org to offset all its emissions associated with shipping and receiving as well as employee commuting. Some are skeptical of the rush to plant trees, however. Ken Caldeira, associate professor in Stanford University's Department of Global Ecology, cautions carbon merchants not to plant trees in areas nature has already dictated they weren't meant to grow, particularly far north in the tundra. "Trees in snowy regions absorb a lot of sunlight that otherwise would have been reflected to space by the snowy fields," thereby creating more problematic warming. Carbon neutrality is still new to the wine world, but things are changing quickly. "Last year we released the news that we had become the world's first carbon-neutral winery, and were met with resounding silence," said Pearce. "Six months later things have changed. Interest in carbon neutrality is huge." Carbonfund.org's Stewart maintains that carbon neutrality is critical for all winemakers. "We're basically talking self preservation here," he said. "I mean really, if it's not in the interest of wine producers to have stable, predictable weather patterns for growing specific grapes with delicate character," he said, "then we should all just hang it up and start drinking beer instead."